The Eighteenth Judicial District Commission on Judicial Performance, by a vote of 6 to 4, recommends that Judge F. Stephen Collins BE RETAINED. Judge Collins is a native of Arapahoe County. After graduating from Cherry Creek High School in 1972 he obtained a business degree from the University of Colorado (Boulder) in 1976 and then obtained his law degree from the University of California, Hastings College of the Law, in 1979. Judge Collins returned to Colorado in 1980 after having clerked for Justice Edmond Burke of the Supreme Court of Alaska. Judge Collins practiced in Denver for 30 years, specializing in commercial litigation, before being appointed as a District Court Judge, effective February 1, 2011. Judge Collins has been very active in teaching and community service. He has served on the faculty of the Rocky Mountain Regional program of the National Institute of Trial Advocacy every year since 1992 and has taught a variety of courses (sales, commercial paper and secured transactions) as an adjunct professor at the University of Denver, Sturm College of Law. The commission conducted a personal interview with Judge Collins, reviewed opinions he authored, observed him in court, and reviewed surveys sent to attorneys and non-attorneys. Among the survey questions was “how strongly do you recommend that Judge Collins be retained in office, or not retained in office?” Of attorneys responding to the survey, 53% recommended retaining, 30% not to retain, and 17% made no recommendation regarding retention. Of non-attorneys responding to the survey, 90% recommended retaining, 4% not to retain, and 6% made no recommendation regarding retention. (These percentages may not total 100% due to rounding). Judge Collins has presided over domestic matters and currently presides over civil and criminal matters. 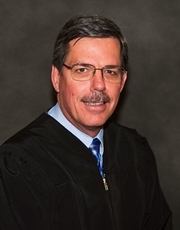 The survey of Appellate Judges regarding District Judges rated Judge Collins’ overall performance as a judge slightly higher than all District Judges standing for retention. A survey of non-attorneys regarding District Judges rated Judge Collins slightly higher than all District Judges standing for retention for his demeanor, fairness, communications, diligence and application of law. The Commission feels the need to implement an improvement plan, for Judge Collins as a result of low scores from attorneys responding to the survey, in which Judge Collins has agreed to participate, to address issues primarily related to his demeanor. However, the Commission has no concern about Judge Collins’ legal ability and judicial acumen, and feels he is on the cusp of becoming an outstanding judge.